Crescent-shaped Santorini is considered the precious gem of the Aegean. Escape to this mythical, magical island oasis with its world famous sunsets, white washed cliff top villages against the background of brilliant sky and crystal clear blue oceans, black sand beaches, and volcanic cliffs. Get away for 7 nights of bliss. Experience daily yoga and meditation practice, fresh, organic locally prepared meals, adventure and sun, all surrounded by ocean. Santorini is the perfect blend of relaxing escape and jumping off point for adventure. Explore volcanic hot springs, watch world famous sunsets from the Caldera cliffs and sun yourself by the pool or one of the beautiful black sand beaches close by. About our venue: Your retreat home base of Oia is located high up on what is considered the balcony of Santorini. Oia is known for its amazing views of the volcano. Just two kilometers from the beach with inspiring walks and views all around, Oia is the perfect spot for relaxation, meditation, and taking in the natural beauty of our stunning location. Massages can be booked for you to take place at the retreat centre. Daily brunch will be served after our morning practice. Healthy organic evening meals are included and are grown from the retreat centre’s garden. Lunch is available for an additional cost at the retreat centre restaurant, or you can explore the nearby village during your down time. Your $350 deposit reserves your room! We expect this to fill fast. Deposits are non refundable. It’s our third year in the beautiful mountains of Western Maine - join us at one of the most stunning times of the year in a gorgeous mountain view estate complete with a hot tub, private heated pool, and fire pit. There’s nothing like a little time away to re-charge your batteries, discover something new about yourself, and find time for transformation and bliss. Immerse yourself in the limitless qualities of love, joy, compassion as we explore a weekend of yoga, connection, meditation and adventure. We’ll start each day with a meditation (either in our stunning floor to ceiling windowed practice space facing the mountains or on the deck surrounded by nature!) and a yoga practice. You can plan for a more active practice to start the day and a SPA Yoga® or restorative style class to wind down the evenings. We’ll leave plenty of time for relaxing under the stars in the hot tub (or you might even want your morning coffee or tea out there!) exploring the area, journaling, and hiking and time outdoors. All meals prepared daily be personal chef and yogi extraordinaire Jen Karmon. Make Your Own mala at the start of the retreat to practice with and take home! Visioning exercises: dream up what the next year will hold for you in the quiet space and fresh mountain air! Group Hike in the nearby mountains and optional outdoor activities TBD! Welcoming intention setting and saging ritual and closing ritual by firelight. Retreat Gift Memories and inspirations to take with you through the rest of your year! Optional Add on Massage during your stay! $680 early bird pricing if reserved by May 1st. CEUS are available for yoga teachers! 6 nights of bliss at a jungle and beach paradise! 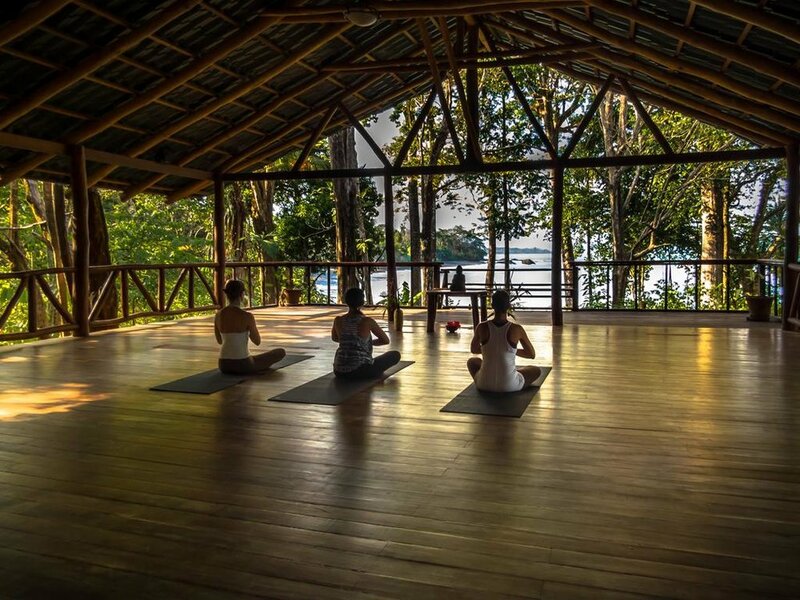 Practice yoga over looking the pristine ocean, meditate on the beach, take a surf lesson and relax to the sounds of wildlife. Registration and Details Coming Soon! These retreats always sell out - message me below to be the first to know when registration opens! Save the date! We’ve got our annual women’s retreat on the calendar and some magical recharging and transformation planned! Hit the reset button and create some time and space for yourself in this beautiful mountain retreat home. Weekend includes fresh, healthy meals prepared daily by yogi chefJen, daily yoga and meditation practices including Flow Class, Workshop style classes, and SPA Yoga® and yoga nidra. We will leave space in the day for your personal exploration of nature, journalling, and goal-setting, as well as time to hang in the hot tub under the stars. $425 for the weekend (early bird pricing; register by June 1 for this rate)and a shared occupancy room. Includes dinner Friday night, brunch and dinner Saturday, and brunch on Sunday. Retreat is limited to 10 participants. Your $100 deposit secures your spot. Deposits are non-refundable. Sanctuary. Blss. Surrender. Freedom. All things we can access when we connect to our own inner wisdom. The ability of a community and a group to create an intention and energetic shift is a powerful thing. In this two hour experience, you will connect not only to your own energy and your own inner sanctuary, but to that of the group and sangha at Maine Yoga Fest as we set the tone together for our weekend. In this delicious and extended candle lit SPA Yoga® flow, allow your thinking mind to take a back seat as you let your senses of touch, smell, taste, and sound lead the way into a euphoric state that connects with your own inner wisdom and your own inner sanctuary. Be part of a collective sensory experience - weave your intention in a net of intentions that will remain up at the festival for the length of the weekend. Awaken your sense of touch with self massage techniques throughout class and with luxurious hands on assists from a group of SPA yoga assistants trained in the art of SPA Yoga massage. Aromatherapy throughout the experience helps to guide you even deeper into a bliss like state, and live music with the Bhakti Collective will wash over you as you create a shift of energy and move awareness more inwardly with every single breath. Engage your sense of taste with a special chocolate meditation following a blissful yoga nidra. Get ready to walk out of the practice feeling like you’ve just left a spa! The Bhakti Collective is a musical group devoted to creating primal and ethereal sounds to help ground students during their yoga practice. Every performance is unique to the energy and flow of the class, providing instances that are special to each present moment. Please note: This is a stand alone ticket. You can purchase yours for Friday night alone, or in addition to a festival pass for the rest of the weekend! Hit the reset button and create some time and space for yourself in this beautiful mountain retreat home. Weekend includes fresh, healthy meals prepared daily by Jen, daily yoga and meditation practices including Flow Class, Workshop style classes, and SPA Yoga® and yoga nidra. We will leave space in the day for your personal exploration of nature, journalling, and goal-setting, as well as time to hang in the hot tub under the stars. $350 for the weekend and a shared occupancy room. Includes dinner Friday night, and brunch and dinner Saturday, brunch on Sunday. Retreat is limited to 10 participants. Your $100 deposit secures your spot. Email Sarah to Sign Up. With Betty Riaz, Sarah Spiegel, and Jen Howell. This weeklong SPA Yoga® level one and level two training has been developed for 200 hour certified yoga teachers who like to learn to teach a restorative flow. Includes: All CEU and education requirements to teach SPA Yoga®, daily breakfast and dinner for four nights, room and board and transportation to and from the Cancun airport. Airfare not included. Non SPA trainees, partners, friends, and beach lovers also welcome! In this slow-flow, floor based, whole-body sensory experience of SPA yoga®, we will use the signature SPA Yoga® sequence to journey the path of the subtle body using the Koshas, the five energetic sheaths within us, as touchstones. We will infuse the foundational SPA Yoga experience of a slow-flow, floor-based, whole-body sensory practice with pranayama and vivid visualizations designed to help you make a powerful connection to these energetic layers—physical body, prana energy body, sensing body, wisdom body, and radiant bliss body. We will harness the opening of body, breath, and mind to access these layers, culminating in a guided meditation and extra lucious savasana and yoga nidra that will connect you to your radiant bliss body in a way you that will leave you floating into the rest of your day. By engaging all five of the senses with soft candlelight, soothing music, aromatherapy, lots of hands-on, massage-like assists, and a renewed awareness of taste (and chocolate! ), SPA Yoga® aligns practitioners with the inner wisdom of deep relaxation. Be prepared to feel like you've just walked out of a SPA! Take some time to turn off your thinking mind, and feel your way through a luscious signature candle lit SPA Yoga® flow set to live music. We will allow our thoughts to take a back seat as the intuitive body and wisdom within all of us takes over. SPA Yoga® is a slow-flow, floor-based, whole-body sensory experience based on Fluid Yoga® sequencing. By engaging all five of the senses with soft candlelight, soothing music, aromatherapy, lots of hands-on, massage-like assists, and a renewed awareness of taste (and chocolate! ), SPA Yoga® aligns practitioners with the inner wisdom of deep relaxation. The physical practice takes time to open the body’s subtle energy and prepares students to experience new depths of awareness in an extended, extra delicious, guided savasana. Be prepared to feel like you just walked out of a SPA! Join HART of Maine and Samudra Studio for a very special yoga class! Shelter kittens – all available to be adopted – will take over the studio while participants enjoy a gentle yoga flow. This is an all levels, gentle class; no prior yoga experience is needed. Enjoy a flow from 11-12:15 pm, and perhaps meet your future feline family member! All proceeds from your $20 class price will support HART of Maine. If you are interested in adopting after the event, HART recommends you fill out their adoption form in advance. HART is always in need of the following supplies for kittens; please consider bringing one of the below items to contribute. Yay Kittens! Sign me up!